Data Generator Generate data sets with continuous, categorical, grouped and correlated data. Great for creating data sets for examples and for quality assurance testing. Data sets are created in standard .CSV format so they can be opened in most statistical programs such as SAS, SPSS, WINKS and into spreadsheet programs such as Microsoft Excel. Order now. These WINKS statistics tutorials explain the use and interpretation of standard statistical analysis techniques for Medical, Pharmaceutical, Clinical Trials, Marketing or Scientific Research. 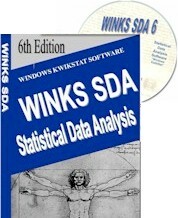 The examples include how-to instructions for WINKS SDA Version 6.0 Software. Download evaluation copy of WINKS. Definition: Used to compare the mean of a sample to a known number (often 0). Assumptions: Subjects are randomly drawn from a population and the distribution of the mean being tested is normal. Test statistic: The test statistic, t, has N-1 degrees of freedom, where N is the number of observations. Results of the t-test: If the p-value associated with the t-test is small (usually set at p < 0.05), there is evidence to reject the null hypothesis in favor of the alternative. In other words, there is evidence that the mean is significantly different than the hypothesized value. If the p-value associated with the t-test is not small (p > 0.05), there is not enough evidence to reject the null hypothesis, and you conclude that there is evidence that the mean is not different from the hypothesized value. A low value of p supports rejection of the null hypothesis. 1. Perform a single sample t-test on this data. 2. What are your hypotheses? 3. What conclusion do you make? 4. Use the Detailed Statistics option to calculate a 95% confidence interval on the mean. How does this approach differ from doing the t-test? "Best value for an easy to use and extensive statistical program." Basic edition starts at $99. Statistical Software designed for your needs -- Medical, Clinical Trials, Dissertation, Thesis, Business, Marketing, Agriculture, Forestry, Science and Research. WINKS is an economical, reliable and simple to use statistical analysis tool designed to help students and researchers get the statistical answers they need quickly and without hassle. It contains a wide range of statistical tests including many handy features not found in programs such as SPSS or SAS -- for example, easy analysis from summary data (as well as from raw data), nonparametric multiple comparisons, APA standard analysis write-up suggestions and more. Statistical test such as t-tests (paired t test, independent group t test/unpaired t test), ANOVA, regression, correlation, repeated measures, logistic regression, times series analysis, chi-square, Bland-Altman, Kruskal-Wallis, Mann-Whitney and much more. Added ability to calculate new column of z-scores for numeric variables. Increased maximum groups to 40 for one-way ANOVA and one-way repeated measures (40 repeats). Added editor option to create indicator variables from categorical variables. Added Outcomes and Probabilities module that calculates combinations and permutations. Added Grubbs & Tukey tests for outliers. Updates are free to current users. Read more about WINKS features. WINKS -- a simple to use and affordable statistical software program that will help you analyze, interpret and write-up your results. Download a free trial copy. Data analysis software that's easy to use.